Federal wildlife officials are exploring a plan to shoot thousands of barred owls in Northern California, Washington and Oregon in an effort to protect another species of owl: the threatened northern spotted owl. Spotted owls have been in decline for decades, mainly due to the logging of their old growth habitat. But even now with protections and programs to help restore them, they're not bouncing back. Scientists say part of the problem is the barred owl. Barred owls are an invasive species, originally from the Eastern US. They first arrived in spotted owl territory in Washington and have been moving south down the coast – which makes this owl the frontline of the invasion. "The barred owl is a little larger. It's a little more aggressive. And so in other areas where you have barred owls set up, the spotted owls aren't there anymore," says Merkle. Barred owls take over spotted owl territory and in some cases, even attack them. 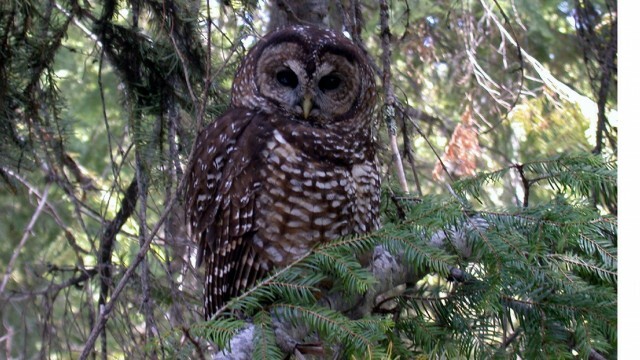 In places like western Washington, the spotted owl population has been cut in half since the barred owl showed up. Biologists at the U.S. 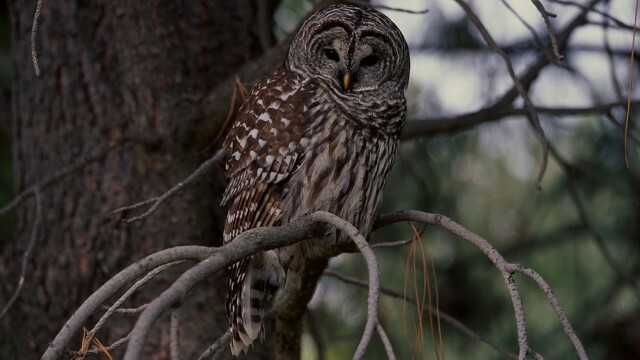 Fish and Wildlife Service say they explored several plans to help the spotted owl population, but they decided the best plan was to try killing about 3,600 barred owls in four study areas. “Every year we wait is another year the spotted owls are declining,” said U.S. Fish and Wildlife biologist Robin Bown. While the federal agency is understandably reluctant to pursue a strategy of hunting the barred owls, Bown says their proposal is the most effective plan. The agency will make a final decision on the plan in a month, and owls hunts could begin this fall.